Eggs are pearly white, oval with rounded ends, and 0.5 mm in length. Eggs are deposited on the host and readily fall into the environment within a few hours. Larvae are maggot-like, approximately 0.5 cm long, and covered with many small hairs. Larvae feed on blood in adult flea feces, organic debris, flea eggshells, and other flea larvae. Flea larvae will not develop outdoors in areas exposed to prolonged periods of direct sunlight. Common sites of outdoor larval development are cool, shady areas or areas of shifting shade where pets rest. 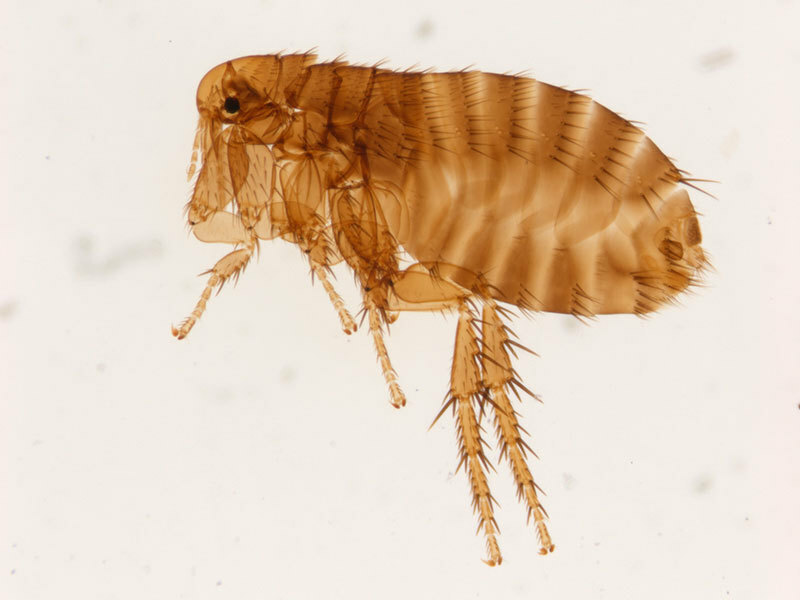 It is important to note that fleas will develop comfortably where pets feel comfortable. Development occurs indoors in undisturbed, protected sites (e.g., in carpets, under furniture, along baseboards). Speed of larval development to pupae is dependent on temperature and humidity. Whitish pupae (cocoons 0.5 cm long) can be found in soil, in vegetation, in carpets, under furniture, and on animal bedding. Adult C. felis can begin emerging about 8 days after initiation of pupal development; all fleas are usually emerged by day 13 at 24°C (75.2°F) and 78% relative humidity. Adult C. felis may remain quiescent in the cocoon for up to 30 weeks at 11°C (51.8°F) and 75% relative humidity. Delayed emergence occurs when there are no appropriate environmental stimuli. Mechanical pressure, CO2, and increased temperature stimulate flea emergence. 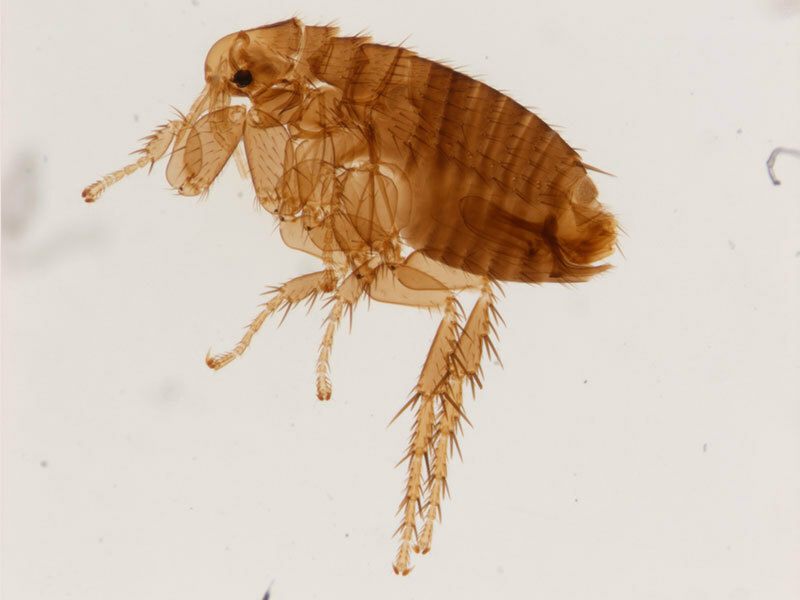 In temperate climates, 90 to 95% of fleas emerge within 21 to 35 days. 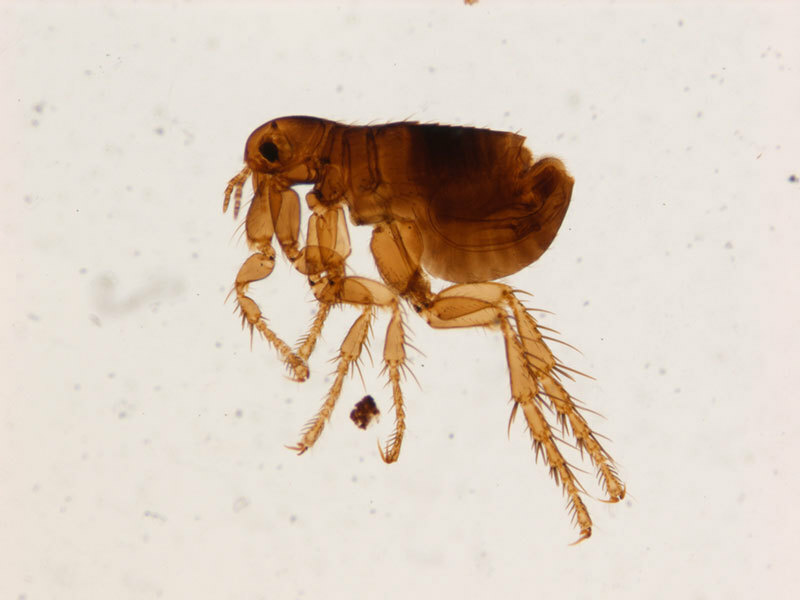 In subtropical climates, 96 to 99% of fleas emerge within 14 to 28 days. Adults begin feeding immediately when on the host. Blood excreted by adult fleas dries into reddish-black pellets in the hair coat ("flea dirt" or "frass"). Egg production begins within 20 to 24 hours of females taking their first blood meal. Female fleas can produce 40 to 50 eggs per day. Under normal conditions, most adult fleas generally survive 2-3 months. Ctenocephalides felis survives for 10 days at 3°C (37.4°F) or 5 days at 1°C (33.8°F). 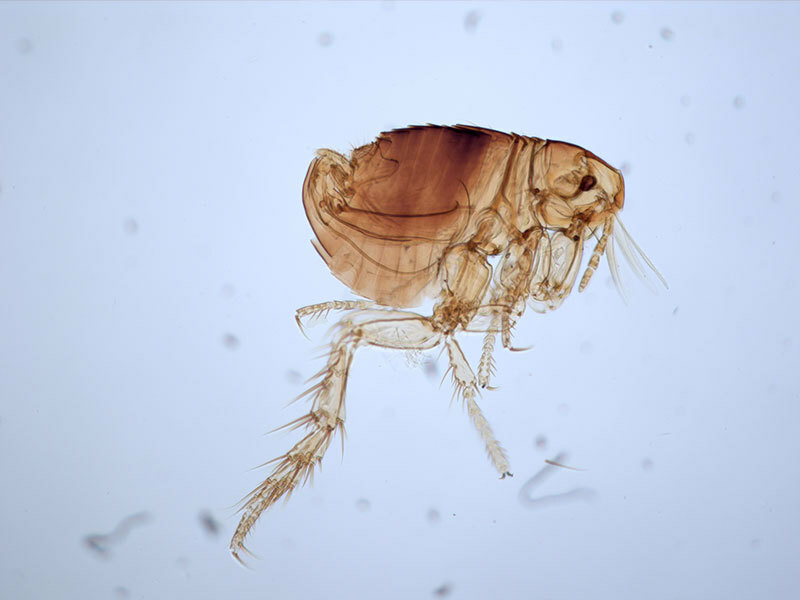 In cold climates, fleas survive as adults on dogs and cats or wild mammals or within pupal casings as preemerged adults in protected environments. Xenopsylla cheopis is more sensitive to colder weather compared to other flea species, and thrives in drier climates. Annoyance and pruritus are common complaints. Heavy infestations may lead to iron deficiency anemia and death, particularly in young animals (dogs, cats, goats, cattle, and sheep). Ctenocephalides felis is capable of transmitting Rickettsia typhi, Rickettsia felis, Bartonella hensalae, Dipylidium caninum, and Acanthocheilonema (Dipetalonema) reconditum. Xenopsylla cheopis is known to transmit Ricketssia typhi (murine typhus), Salmonella enteriditis (salmonellosis), Yersinia pestis (plague), Trypanosoma lewisi (murine trypanosomiasis), Hymenolepis diminuta (rodent tapeworm), Hymenolepis nana (dwarf tapeworm). Fleas can also transmit hemoplasmas (formerly Hemobartonella spp. ; now known as Mycoplasma spp. ), and Francisella tularensis (tularemia). Flea allergy dermatitis (FAD) is caused by hypersensitivity to antigenic material from the salivary glands of fleas. Ctenocephalides felis is the most common ectoparasite of dogs in North America. Ctenocephalides felis is uncommon where relative humidity remains below 50% (desert southwest and Rocky Mountain states). Xenopsylla cheopis is a denizen of drier habitats. Ctenocephalides felis infests dogs and cats as well as many other mammalian and avian hosts. Ctenocephalides canis infests wild and domestic canids. Echidnophaga gallinacea infests poultry and occasionally dogs, cats, foxes, and various rodents in the southern United States. Pulex simulans infests rodents as well as dogs, cats, coyotes, foxes, opossums, raccoons, and other animals. Pulex irritans infests humans and also dogs, cats, foxes, pigs, and other animals. Xenopsylla cheopis most commonly infests domestic rats, it also readily feeds on humans, dogs, cats, chickens, and other hosts. Adult C. felis uses visual and thermal cues to locate hosts. Newly emerged cat fleas survive only a few days before requiring a blood meal. In most homes, newly emerged fleas die within 1 to 2 weeks without a host. Acquiring newly emerged fleas from an infested environment is the primary cause of the initiation of an infestation. However, adult fleas can transfer directly from one host to another. Physical examination of the host is the first step in identifying fleas or flea feces within the hair coat. Flea feces can be removed with a flea comb and placed on a wet towel; the feces will dissolve and turn red. Less frequently maggot-like larvae are seen in areas in the environment frequented by pets. Eggs and pupae are observed less often because they are small, not motile and blend effectively into their environments. Comprehensive flea-control programs should eliminate fleas on pets, eliminate existing environmental infestations, and prevent subsequent re-infestation. Moderate to severe infestations may take several months to bring under control. Certain flea insecticide formulations contain insect growth regulators (IGRs) either alone or in combination with adulticides. These agents, which include lufenuron, methoprene, and pyriproxyfen, prevent flea eggs from hatching and kill larvae or early pupae. Another strategy includes the incorporation of IDIs such as lufenuron into broad spectrum heartworm preventive and intestinal parasite control products. Such combinations deliver efficacy against flea eggs and larvae while also preventing heartworm disease and treating and controlling intestinal parasites. Occasionally, label-recommended use of flea control products will not appear to control the problem. This may be real or perceived, based on pet owner expectations of product performance, frequency of bathing, and reinfestation rates. If additional control measures are needed, products may be combined, environmental control may be implemented, or frequency of application may be increased if label allows. Federal law prohibits the extra-label use of pesticides regulated by the U.S. Environmental Protection Agency. Administer preventive flea and/or tick products as soon after birth as possible (consistent with label claims) for the life of the pet. However, because substantial geographic differences occur in flea prevalence and seasonality, prevention programs should be tailored to needs of the individual pet. 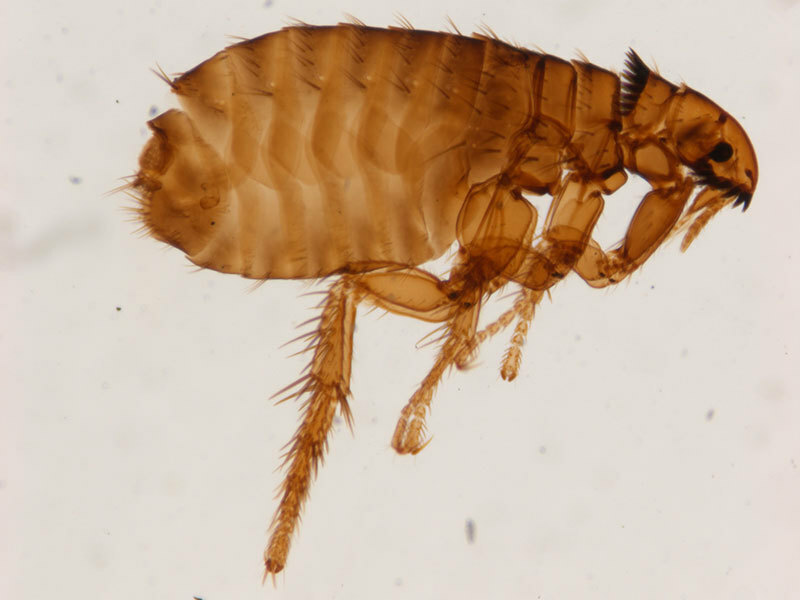 The common flea of dogs, C. felis, transmits a number of zoonotic agents, including those that cause cat scratch disease (B. henselae), murine typhus (R. typhi), flea-borne typhus (R. felis), and tapeworms (D. caninum).Ingestion of infected fleas by children has resulted in development of adult D. caninum (tapeworm) in a large number of pediatric cases. Rodent fleas that may be acquired by dogs and cats in southern Rocky Mountain states and southwestern states may be vectors for bubonic plague (Y. pestis). 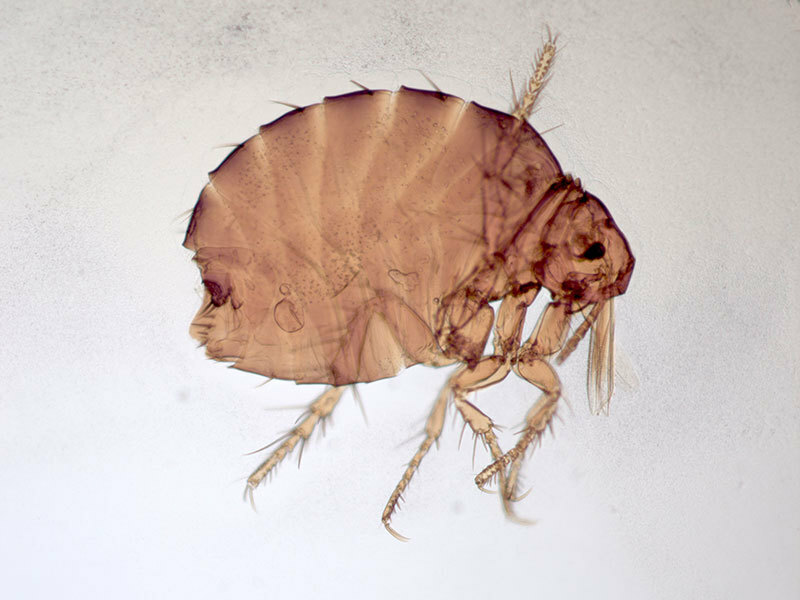 These fleas may leave the host to bite humans. 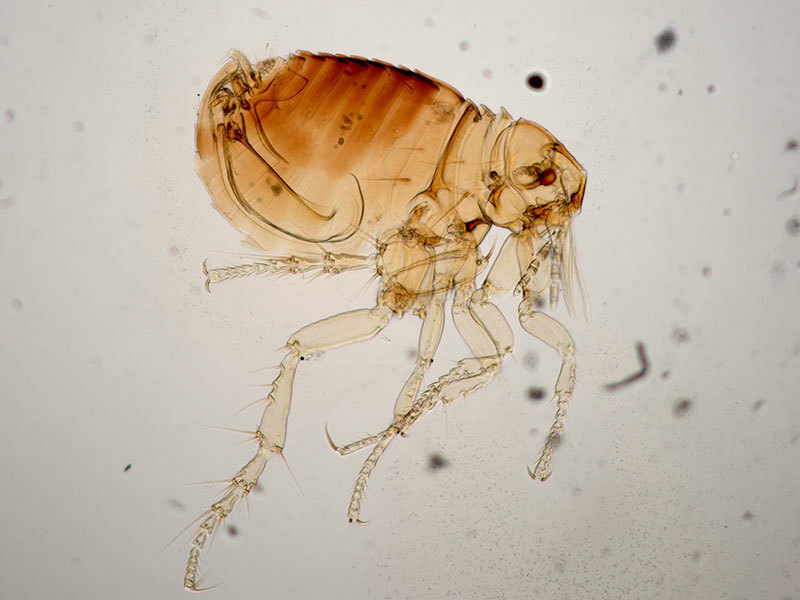 Flea infestation of homes and areas around a home often results in humans being bitten by newly emerging fleas, inciting an allergic response. The resulting papular rash can be mild to extensive, depending on numbers of fleas and individual hypersensitivity reactions. Little SE, Starkey LA. Conquering Fleas: Preventing Infestations and Limiting Disease Transmission. Today’s Veterinary Practice Nov/Dec, 2012. Blagburn BL, Dryden MW. Biology, Treatment, and Control of Flea and Tick Infestations. Vet Clin North Am Small Anim Pract 39: 1173-1200, 2009. Rust MK, Dryden MW. The Biology, Ecology, and Management of the Cat Flea. Annu Rev Entomol 42: 451-473, 1997. McElroy KM, et al. Flea-associated Zoonotic disease of Cats in the USA: bartonellosis, flea-borne rickettsioses, and plague. Trends Parasitol 26: 197-204, 2010. Eisen RJ, Gage KL. Transmission of flea-borne zoonotic agents. Annu Rev Entomol 57: 61-82, 2011. Mullen G, Durden L. Medical and Veterinary Entomology. San Diego: Academic Press, 2002. Kreppel KS, Telfer S, Rajerison M, Morse A, Baylis M. Effect of temperature and relative humidity on the development times and survival of Synopsyllus fonquerniei and Xenopsylla cheopis, the flea vectors of plague in Madagascar. Parasites and Vectors 9: 82, 2016. *Other flea species may on occasion parasitize cats. Flea larvae will not develop outdoors in areas exposed to sunlight. Common sites of outdoor larval development are cool, shady areas where pets rest. Development occurs inside in undisturbed, protected sites (e.g., in carpets, under furniture, along baseboards). Whitish pupae (cocoons 0.5 cm long) can be found in soil, on vegetation, in carpets, under furniture, and on animal bedding. Heavy infestations may lead to iron deficiency anemia and death, particularly in young animals (cats, dogs, goats, cattle, and sheep). Ctenocephalides felis is capable of transmitting Rickettsia typhi, Rickettsia felis, Bartonella henselae, and Dipylidium caninum. Fleas can also transmit hemoplasmas (formerly Hemobartonella spp. ; now known as Mycoplasma spp. ), Yersinia pestis (plague), and Francisella tularensis (tularemia). Ctenocephalides felis is the most common ectoparasite of cats in North America. Ctenocephalides felis infests cats as well as many other mammalian and avian hosts. Echidnophaga gallinacea infests poultry and occasionally cats, dogs, foxes, and various rodents in the southern United States. Pulex simulans infests rodents as well as cats, coyotes, dogs, foxes, opossums, raccoons, and other animals. Pulex irritans infests humans and also cats, dogs, foxes, pigs, and other animals. Certain flea insecticide formulations contain insect growth regulators (IGRs) or insect development inhibitors (IDIs) either alone or in combination with adulticides. These agents, which include lufenuron, methoprene, and pyriproxyfen, prevent flea eggs from hatching and kill larvae or early pupae. 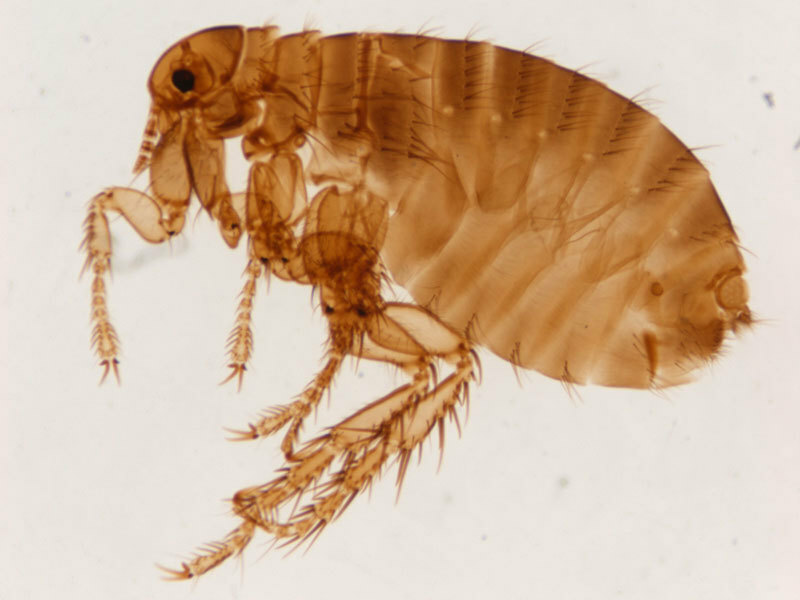 The common flea of cats and dogs, C. felis, transmits a number of zoonotic agents, including those that cause cat scratch disease (B. henselae), murine typhus (R. typhi), flea-borne typhus (R. felis), and tapeworms (D. caninum).Ingestion of infected fleas by children has resulted in development of adult D. caninum (tapeworm) in a large number of pediatric cases. Rodent fleas that may be acquired by cats in southern Rocky Mountain states and southwestern states may be vectors for bubonic plague (Yersinia pestis). 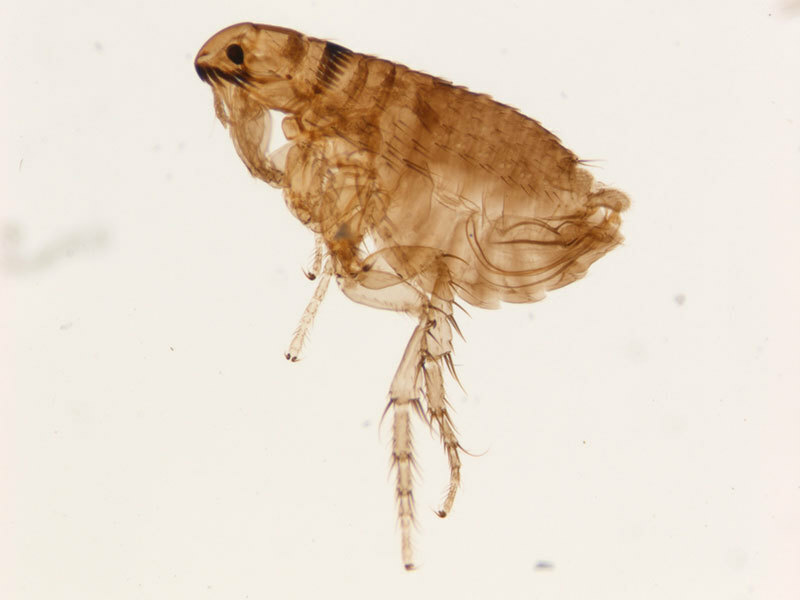 These fleas may leave the host to bite humans.